Drummer and composer Brian Bennett is the man behind the exciting, tension-filled music on Drama Montage Volumes 1 & 2 – two of the finest albums within the Bruton Music library. Best known as the drummer with legendary pop group The Shadows, in the ’60s Bennett’s career as composer took off. He kick-started his career as a composer of library music in the ’70s at the KPM 1000 Series under the aegis of Robin Phillips; when Phillips left to form Bruton Music, Bennett went with him. Drama Montage, recorded in 1978, was his first Bruton Music assignment – an album aimed at the world of television thrillers and cop shows. Bennett came up with a brilliant set of compositions ideally suited to car chases, shoot-outs, stakeouts and all manner of contemporary dramatic situations. As a result, the Drama Montage material turned up in shows such as The Sweeney, Strangers, Shoestring, Bergerac and Return of the Saint. 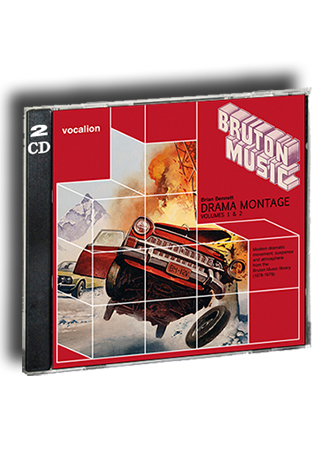 More than three decades on, Drama Montage Volumes 1 & 2 are as exciting and engaging as they ever were and illustrate why Bennett enjoyed such success as a library music composer. Includes an 8-page booklet detailing the history of Bruton Music as well as biographical information and the stories behind the albums. Remastered from the original analogue tapes. First time on CD.